Beautiful, fragrant spring bouquets are synonymous with Mother’s Day. Research indicates that flowers are one of the most popular gifts for mom and something moms love- right after hearing from you how much you love and appreciate her! What flowers are best for Mother’s Day? You could go pick up some grocery store special. Mom loves things you make, so why not DIY a beautiful mother’s day bouquet for her? In that spirit, we enlisted the help of a florist to create three DIY mother’s day bouquets to give you a little inspiration to create your own mother’s day arrangement this year. Why She’ll Love It: This bouquet just oozes fancy- from the gorgeous mix of roses to the luscious green trick flowers and trendy eucalyptus. Mom will love the shades of red blended with pinks and greens and the height of the vase will make sure this arrangement gets noticed. We are pairing this bouquet with a lovely floral scented candle because mom loves it when things smell nice. Why She’ll Love It: Lavender and lilac mean just one thing: relaxation! Wouldn’t it be nice to give mom a relaxing moment this mother’s day? This bouquet also add some orchids which bring home the zen theme. 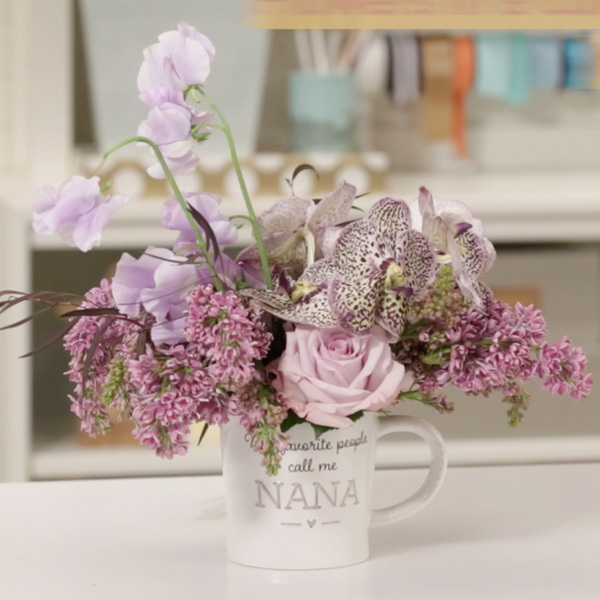 Note that we made this bouquet in one of our awesome nana mugs. Giving her a bouquet inside a great mug will remind her of how awesome mother’s day was all year long. Pick up one of those (we have mom and grandma captions, too!) at Hallmark.com or your local Hallmark Gold Crown Store.